Today, Mediterráneo Exprés Transport knows the concerns of the market and this is why it is one of the most important transport companies specialized in the logistics of furniture. This growth has been possible thanks to continuous investment in the improvement of infrastructures, incorporating new technologies, and constant support in the specialization of the human factor. Our main goal is to give our customer the best possible service for goods to arrive in perfect condition and within the agreed time frame. Mediterráneo Exprés is a company specialized in logistics to service furniture transportation, with over 50 years of experience in the sector. We mainly work with manufacturers, importers and exporters of furniture, decoration shops, warehouses of wholesale and retail distribution, as well as liberal professionals in the furniture sector; with total reliability and seriousness in deliveries and payment on delivery. Since 2018 is part of the prestigious Group MACH-3000, a european business alliance specialized in furniture logistics all over Europe. MACH-3000 counts on a group of companies to offer transport and logistics services globally, both B2B and B2C. 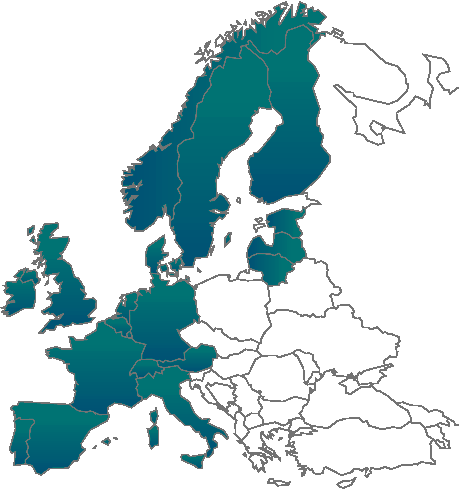 The alliance is composed by transport companies such as Jan Krediet (Holland), LGT Logistics A/S (Danemark), DB Schenker (Italy), Girard Agediss (France) o KLOG Transport Solutions (Portugal). Thanks to this alliance, Mediterráneo Exprés offers the possibility to pick up furnitures in each European country to deliver them in Spain and Portugal weekly. This is the map of Mach3000 countries partners. We have logistics warehouses in Madrid, Barcelona, Alicante and Valencia; all of them equipped with the necessary technology to provide an excellent distribution in the transport of furniture and other goods. Mediterráneo Exprés provides a “door to door” service and personal attention to each customer given by our sales agents. A meticulous attention to every detail is a synonym for our professionalism. If you need a fast service, we give you the best solution: our 24 hour delivery service offered by our local offices. The prestige of our customers is based on our fast and quality service. We have insurance which guarantees the value of your goods and modern software for a full traceability of the service that you will be able to control thanks to a username and password that we will provide to you. Special carts to properly secure goods and avoid manipulation during transport processes and until they arrive to the final destination. Currently, the company has the ISO 9001 Quality Certification by AENOR.